1972-1987 Z50A/Z50R Fuel Tank Rubber. This is the rear large rubber gasket that the tank sets on. It is #11 in the diagram. Will NOT work with Clone tanks. Will fit Z50A 1972-1978, Z50R 1979-1999, ATC70 1978-1985. 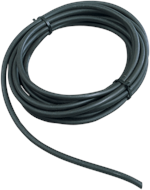 Universal 3/16th Black Fuel Line. This comes in a coil of 25', so you can use on more than one project! Please note that this is fuel line is not for use with fuel containing more than 10% alcohol. Z50 Gas Tank Rubber for the back of the gas tank. Number #18 in diagram. Will not work with Clone tanks. For Z50A 1969-1971 and QA50 1971-1975. Replacement fully assembled Z50 Fuel Petcock. Will not work with clone tanks. 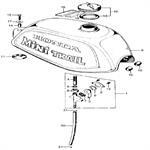 Will fit: Z50A 1969-1978; QA50 1971-1975; MR50 1974-1975; P50 1968 and a PC50 1970. 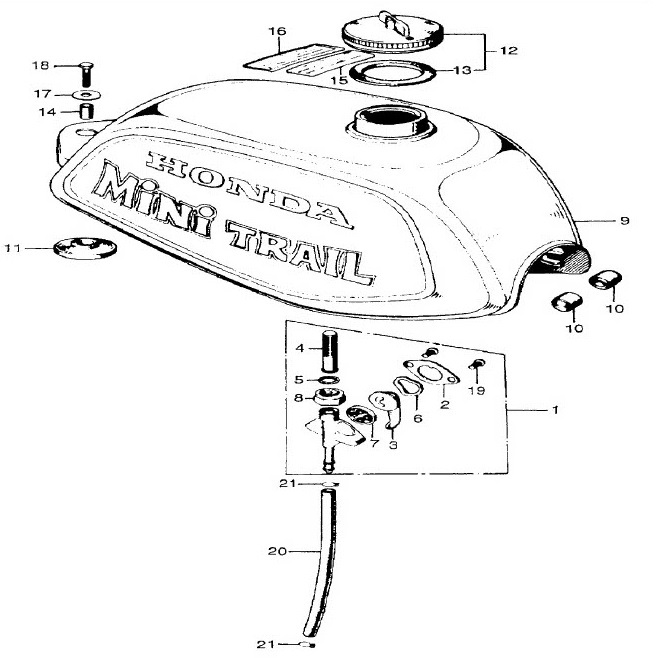 It is #1 in the diagram. 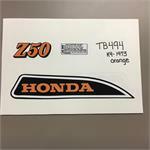 Z50A Gas Tank Decal set for the 1978 model. Includes the side cover and warning stickers. Our decals are made from vinyl with dual layers, we use a thin protective over laminate. All decals have an extra layer of film to make them waterproof and clear. Z50A and Z50AK1 gas tank rubber for the front of the gas tank. This is #17 in the diagram. These are sold individually. Will fit the Z50A 1969-1970. Z50A Front Circular Gas Tank Rubbers. #17 in diagram. These are sold individually and will NOT work with clone tanks. Will fit Z50A 1970-1978, ATC70 1973-1974, QA50 1971-1975. Z50A Gas Tank Decal set for the 1973/K4 model. Our decals are made from vinyl with dual layers, we use a thin protective over laminate. All decals have an extra layer of film to make them waterproof and clear-coated so the color won’t run.